The appearance of the brow is invested with an emotional, expressive, and psychological significance that makes it one of the most prominent features of the face. As the brow naturally descends with aging, its position often imparts undesired characteristics to the face, such as fatigue, sadness, anger, ennui, or other qualities that do not represent the individual's state of mind. This article focuses on the plastic and reconstructive surgical considerations of the direct brow lift, which involves an incision (and the resulting scar) immediately over the eyebrows. The procedure has waned in popularity as a cosmetic technique, having been replaced by more aesthetically satisfying methods that raise the forehead and the brow. 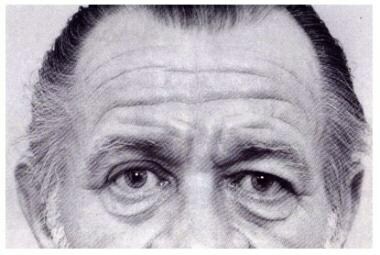 The direct brow lift remains useful in certain clinical situations for functional restoration of the overhanging brow, eg, in persons who are not candidates for more modern forehead-lifting techniques. In 1919, Raymond Passot described excision of the skin and soft tissue above the eyebrows to eliminate wrinkles around the lateral eyes and above the brow. In the ensuing decades, the entire forehead became the focus of rhytidectomy, and various placements of incisions and degrees of undermining within the forehead and scalp were proposed. The early techniques did not produce long-lasting results until it was determined, in the 1950s, that incision of the frontalis muscle was required. Modern bicoronal, endoscopic, and other techniques, in which incisions are placed in hidden areas, have eclipsed the direct brow excision in popularity. Brow ptosis begins as early as the fourth decade of life. It contributes to sagging of the upper eyelid and most often imparts an aged, sad, and tired appearance to the face. Significant upper eyelid hooding may encroach upon the upper visual fields. Brow ptosis and resultant blepharoptosis generates compensatory activity of the frontalis muscle, which, over time, can create horizontal rhytides across the forehead and may contribute to ocular fatigue and headaches. The brow may descend to below the level of the supraorbital ridges. 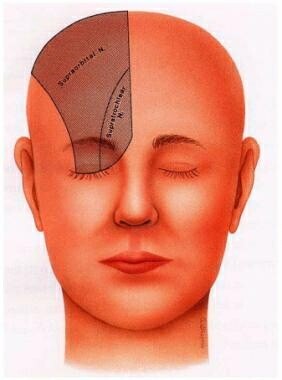 Members of the American Society of Plastic Surgeons performed 43,705 forehead lifts in 2003. This number increased to 112,933 in 2008. The number of direct brow lifts performed is unknown. Patients typically present with concerns related to a facial appearance that is aged, tired, or sad. Lateral support is reduced, and more ptosis develops in the lateral brow than in the medial area. Functional sequelae of brow ptosis, such as deficits in the visual field, headaches, or ocular fatigue, are less common. Major reasons for performing a direct brow lift include (1) improvement in a visual-field deficit caused by overhanging eyebrow skin, (2) relief of ocular fatigue caused by compensatory overactivity of the frontalis muscle, (3) improvement in cosmetic appearance, and (4) requirement for a simple, expedient procedure. The cosmetic indication is tempered by the creation of scars above the eyebrows. This may be a secondary consideration for patients with marked brow asymmetry after previous traumatic injury. Direct brow lift. Typical patient for direct brow excision (McKinney, 1991). Courtesy of Springer-Verlag. Used with permission. Patients who use a thick brow pencil to create the brow also may be candidates because they can conceal the scar with makeup. Scarring may be more obvious in patients with fair-colored eyebrow hair. Specific physical findings that can be better addressed by other methods of brow lifting include ptosis of the forehead and medial eyebrows, transverse forehead wrinkles, vertical glabellar frown lines, transverse wrinkles at the root of the nose that become exaggerated when the forehead is manually depressed, and a drooping nose. The 3 nerves on each side of the forehead that are preserved during a direct brow lift are the (1) supraorbital nerve, (2) supratrochlear nerve, and (3) temporal (frontal) branch of the facial nerve. The supratrochlear nerve traverses the most medial aspect of the supraorbital rim and innervates the ipsilateral corrugator muscle. The nerve travels through the corrugator and is easily cut when the muscle is sectioned to treat frown lines. The supraorbital nerve travels somewhat more laterally over the medial supraorbital rim and divides into 2 branches. The deep branch travels laterally and then superiorly to reach the central frontoparietal scalp and vertex, coursing in a plane between the periosteum and the galea. The superficial branch of the supraorbital nerve divides several times and innervates the central forehead and hairline, coursing through and across the anterior aspect of the frontalis. Both the supraorbital and supratrochlear nerves can be damaged when they leave their bony foramina, where they are more adherent and less easily moved or stretched. See the image below. Direct brow lift. Innervation by the supraorbital and supratrochlear nerves (Seckel, 1994). Courtesy of Quality Medical Publishing. Used with permission. The limited dissection of the direct brow lift avoids the supraorbital and supratrochlear nerves, although removing too much subcutaneous tissue laterally can injure the frontal branch of the facial nerve. Direct brow lift. Ideal brow position. The brow should begin medially at a vertical line extending from the ipsilateral alar base and medial canthus (line A-E). The brow should end laterally at an oblique line extending through the ipsilateral alar base and lateral canthus (line B-E). The medial and lateral ends of the eyebrow should lie at approximately the same horizontal level (line A-B). 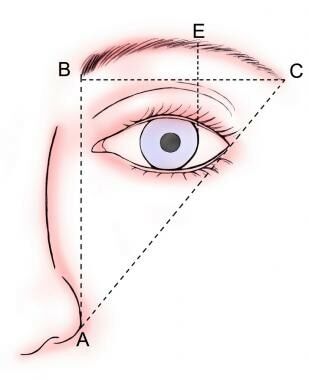 The apex of the brow should lie directly above the lateral limbus of the eye (line C-D). The brow should arch above the supraorbital rim in women and lie approximately at the level of the rim in men. For more information about the relevant anatomy, see Forehead Anatomy and Facial Nerve Anatomy. Patients who cannot tolerate a scar above the eyebrow are not candidates for the procedure. Inadequate upper eyelid skin is a contraindication to any brow lift; the dearth of eyelid skin is often the result of a previous resection for upper eyelid ptosis, without the realization that a brow lift was indicated. Pascali M, Bocchini I, Avantaggiato A, et al. Direct brow lifting: Specific indications for a simplified approach to eyebrow ptosis. Indian J Plast Surg. 2016 Jan-Apr. 49 (1):66-71. [Medline]. [Full Text]. Campbell R, Benson PJ, Wallace SB, Doesbergh S, Coleman M. More about brows: how poses that change brow position affect perceptions of gender. Perception. 1999. 28(4):489-504. [Medline]. American Society of Plastic Surgeons. 2003 Plastic Surgery Statistics. Arlington Heights, Ill: American Society of Plastic Surgeons; 2003. [Full Text]. American Society of Plastic Surgeons (ASPS). National Clearinghouse of Plastic Surgery Statistics. 2009 Report of the 2008 Statistics. ASPS Web site. Available at http://www.plasticsurgery.org/Media/stats/2008-US-cosmetic-reconstructive-plastic-surgery-minimally-invasive-statistics.pdf. Accessed: July 23, 2009. Thorne CHM, Aston SJ. Forehead/brow lift. Aston SJ, Beasley RW, Thorne CHM, eds. Grabb and Smith's Plastic Surgery. Philadelphia, Pa: Lippincott Williams & Wilkins; 1997. McKinney P, Mossie RD, Zukowski ML. Criteria for the forehead lift. Aesthetic Plast Surg. 1991. 15(2):141-7. [Medline]. Johnson CM Jr, Anderson JR, Katz RB. The brow-lift 1978. Arch Otolaryngol. 1979 Mar. 105(3):124-6. [Medline]. Fett DR, Sutcliffe RT, Baylis HI. The coronal brow lift. Am J Ophthalmol. 1983 Dec. 96(6):751-4. [Medline]. Johnson CM Jr, Waldman SR. Midforehead lift. Arch Otolaryngol. 1983 Mar. 109(3):155-9. [Medline]. Withey S, Witherow H, Waterhouse N. One hundred cases of endoscopic brow lift. Br J Plast Surg. 2002 Jan. 55(1):20-4. [Medline]. Seckel BR. Facial Danger Zones: Avoiding Nerve Injury in Facial Plastic Surgery. St. Louis, Mo: Quality Medical Publishing; 1994. Stuzin JM, Wagstrom L, Kawamoto HK, Wolfe SA. Anatomy of the frontal branch of the facial nerve: the significance of the temporal fat pad. Plast Reconstr Surg. 1989 Feb. 83(2):265-71. [Medline]. Ishikawa Y. An anatomical study on the distribution of the temporal branch of the facial nerve. J Craniomaxillofac Surg. 1990 Oct. 18(7):287-92. [Medline]. Ellenbogen R. Transcoronal eyebrow lift with concomitant upper blepharoplasty. Plast Reconstr Surg. 1983 Apr. 71(4):490-9. [Medline]. Freund RM, Nolan WB 3rd. Correlation between brow lift outcomes and aesthetic ideals for eyebrow height and shape in females. Plast Reconstr Surg. 1996 Jun. 97(7):1343-8. [Medline]. Ahn MS, Catten M, Maas CS. Temporal brow lift using botulinum toxin A. Plast Reconstr Surg. 2000 Mar. 105(3):1129-35; discussion 1136-9. [Medline]. Rafaty FM, Brennan HG. Current concepts of browpexy. Arch Otolaryngol. 1983 Mar. 109(3):152-4. [Medline]. Marks MW, Marks C, McGrew L, eds. Aesthetic facial surgery: forehead-brow lift. Fundamentals of Plastic Surgery. Philadelphia, Pa: WB Saunders; 1997. Tyers AG. Brow lift via the direct and trans-blepharoplasty approaches. Orbit. 2006 Dec. 25(4):261-5. [Medline]. Georgescu D, Anderson RL, McCann JD. Brow ptosis correction: a comparison of five techniques. Facial Plast Surg. 2010 Aug. 26(3):186-92. [Medline]. Lewis JR Jr. A method of direct eyebrow lift. Ann Plast Surg. 1983 Feb. 10(2):115-9. [Medline]. Rafaty FM, Goode RL, Fee WE Jr. The brow-lift operation. Arch Otolaryngol. 1975 Aug. 101(8):467-8. [Medline]. Stacey AW, Czyz CN, Kondapalli SS, et al. Risk of ocular blood splatter during oculofacial plastic surgery. Ophthal Plast Reconstr Surg. 2015 May-Jun. 31 (3):182-6. [Medline]. Cadet N, Hardy I, Dudek D, et al. Prospective case-control trial evaluating silicone gel for the treatment of direct brow lift scars. Can J Ophthalmol. 2018 Feb. 53 (1):29-33. [Medline]. Cassileth BR. Evaluating complementary and alternative therapies for cancer patients. CA Cancer J Clin. 1999 Nov-Dec. 49(6):362-75. [Medline]. Ernst E, Cassileth BR. The prevalence of complementary/alternative medicine in cancer: a systematic review. Cancer. 1998 Aug 15. 83(4):777-82. [Medline]. Cho MJ, Carboy JA, Rohrich RJ. Complications in Brow Lifts: A Systemic Review of Surgical and Nonsurgical Brow Rejuvenations. Plast Reconstr Surg Glob Open. 2018 Oct. 6 (10):e1943. [Medline]. [Full Text]. Tenzel PA, Patel K, Erickson BP, et al. Split face evaluation of long-pulsed non-ablative 1,064 nm Nd:YAG laser for treatment of direct browplasty scars. Lasers Surg Med. 2016 Oct. 48 (8):742-7. [Medline]. Marking for direct brow lift. Direct brow lift. Preoperative marking for eyebrow ptosis after partial facial nerve resection. Direct brow lift. Excision to the level of the frontalis. Direct brow lift. Beveling the incision. Direct brow lift. Injury to the temporal (frontal) branch of the facial nerve in a patient referred for treatment. Direct brow lift. Fixation of brow and closure. Direct brow lift. Placement of deep dermal sutures. Direct brow lift. Closed wound.